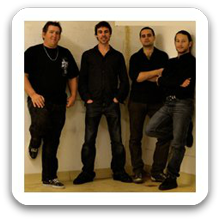 Sydney Band 663 are a 4-piece, high-energy rock outfit playing the best classic and Oz rock from the 60s to now. With over 30 years industry experience between them, the band is guaranteed to rock the house with classics from AC/DC, The Angels, Guns n Roses, Pearl Jam and Foo Fighters, just to name a few. The guys do all the classics you know and love with some killer new hits thrown in, and are constantly updating their set with exciting, fresh new tunes. Sydney Band 663 do the best Oz + classic rock – with great players, fantastic songs and an engaging stage show they’re guaranteed to impress. Sensational gig, got so much positive feedback from friends, closest thing to real deal on covers, highly recommend, made the night a great success.